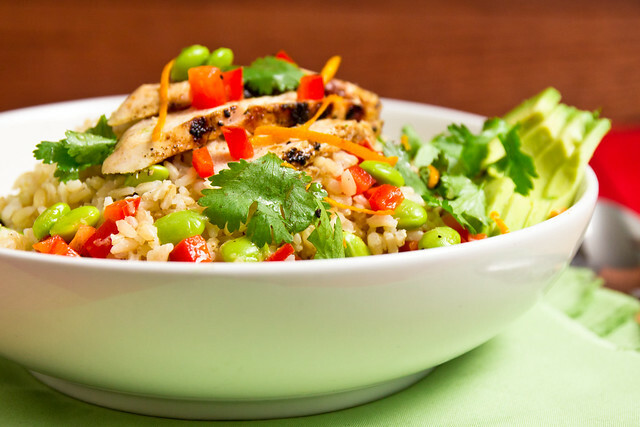 The dish is super fresh and incredibly simple: edamame, red bell pepper, and chicken are tossed with a light dressing made from orange juice, lime juice, and ginger. Served over brown rice, it makes for a light and healthy dinner. If you’re in full-out winter citrus mode like we are, you’ll probably love it, too! 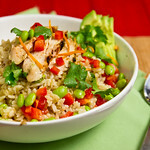 Chicken and edamame in a light orange-ginger dressing, served over brown rice. Cook brown rice in water, according to package instructions. In a medium bowl, whisk together orange juice, lime juice, oil, and ginger. Add edamame, red bell pepper, and chicken, tossing to coat. 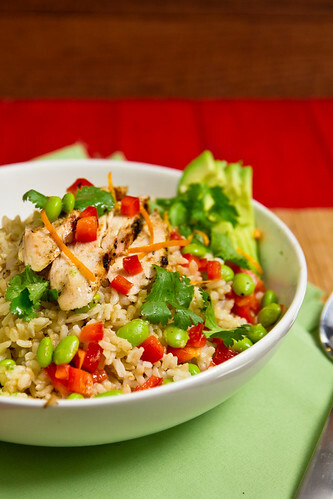 Spoon mixture over brown rice and garnish with avocado slices and cilantro. That dressing sounds amazing – just the thing to brighten up my day! Gorgeous pictures too. Umm, wow. This looks fantastic. I was going to make fried rice for dinner tonight, but I may just have to stop off at the grocery store for a red pepper and lime so I can make this happen tonight instead. . . . This looks like a total winner in every way!! This looks wonderful, but what could I substitute for the edemame? Whatever you’d like! A handful of leftover steamed or roasted broccoli would be great. ummm, this looks amazing. right up my alley. can’t wait to try it- i might throw some mushrooms in there too! Looks goodand easy! Does the oil go in the dressing? Yep! It’s whisked into the orange juice, etc. This looks delicious and what a super healthy meal to kick of new years resolutions with! Yum! Just pinned this recipe so I’ll remember to put it on my menu for next week. Thanks! I take my lunch to work everyday and often find it hard to keep things from getting boring. This is a great idea! i have to laugh bc i kind of like the smell of Subway…however, i’d rather have this any day! I can’t wait to try this! Wow, this looks so good. Gorge color too! Never know what to do with edamame, but know it’s insanely good for you. Dressing sounds delish too. I actually came across an orange vinaigrette made with IPA that I was going to link you and Josie too. Sounded phenomenal! I love having big salads for one meal of the day. I’ll be making this with tofu and I’ll be loving it! That’s such a great idea! I have to remember to pick up quinoa for next week. This looks great, Shawnda. I love all the flavors going on here, and it’s so pretty – adding to the menu soon! This looks like exactly what I want to be eating right now. Am saving this and will probably be making for lunch this week. Thanks! Holy makarol! (how the heck do you spell that?) Anywho, this is just what the doctor ordered. Seriously! I’m spending the week at my parents and I want to introduce healthier recipes to them, probably starting with this. Tasty! This sounds sooo good. I love the entire combination of flavors, but that ginger dressing really takes it over the top! Bookmarked 🙂 This is just my style! Looks delicious!! Definitely bookmarking for the future. Thanks for sharing. This was SO good! I got a high five and a “you rock” from my husband. I had to sub frozen green beans for the edamame because I was out, but it was amazing!!! The avocado MAKES it! Definitely will be making this again!! Thanks for the awesome recipe! this is YUM! I steamed the edamame first so it would be warm and then I realized my avacoda was spoiled, so it was a little different, but it was basically a warm citrus treat. loved it. Thanks! This was AMAZING! Thanks for a new dinner favorite! I absolutely LOVE this recipe and WILL be making it tomorrow for lunch or dinner… or both perhaps? I don’t think I’ve ever been this excited about consuming salad. Sounds amazing. Do you eat this cold or hot? Generally warm if I make it for dinner. But if it’s for lunch, cold. And I always eat the leftovers cold. I just wanted to stop by and thank you for this recipe. I have made it probably 6 times since I first saw it on pinterest. I am making it again for dinner tonight and the leftovers are constantly fought over. I am taking it to my son’s teacher for lunch tomorrow for teacher appreciation week. Love love love this meal! Thanks, it is wonderful…really! Glad to hear you like it, Kelli! Been searching for a healthy recipe for taco bells cantina bowl w/chicken, and this comes close; if uh ave any other suggestions, I’d b very grateful. Sund., trying your cheesy quinoa and broccoli; can’t wait to try it, thank you so much, found u r blog satur. And I’m so excited that everything is healthy. I’m very, very grateful!! !